the sun's rays from the atmosphere. 2. The period of the evening when this takes place between daylight and darkness. The french word for twilight is crypuscule, a word not nearly as romantic-- crypuscule conjures up images of crypts, death, pustules, lesions, maybe even vampires and stakes through the heart. Perhaps it is where the "Twilight" book & film series' (gobbled up by legions of teenyboppers), author got her idea. I love words and hate it when a word gets hijacked. Usually I can rely on the french translation of any word to be melodious and evocative. Picture the word "désabonnement"--non-renewal or cancellation of one's subscription--I see jet black hair tossed back in wild abandon, clothes in disarray, or "se derocher"= from the rock, the reflexive alpiniste falling off a rock face. A single French word commonly replaces a string of words in English. The Japanese word Kotodama or Kototama refers to the cultural belief that mystical powers dwell in words and names. And that sounds can magically affect objects. Koto means "word, speech" and tama means "ghost, spirit, soul". The ritual use of words can alter our state of being and touch the soul of a landscape. Chanting, affirmations, blessings. Years ago I was part of a group blessed on the Burren (the Great Rock) in County Clare Ireland, by the remarkable priest and poet, John O'Donohue. In his book "Stone as the Tabernacle of Memory", he talks about the special nature of ruins, "protrusions of past time into our present...memorials of a past that was never our present." John wrote about the 12th c. Cistercian Abbey in Corcomroe in the Burren where the monks bound the stones one to another and hallowed the countryside and the Abbey with their chanting, liturgy and spirit. It was as though the stones had imbibed the spirit and life of the monks. 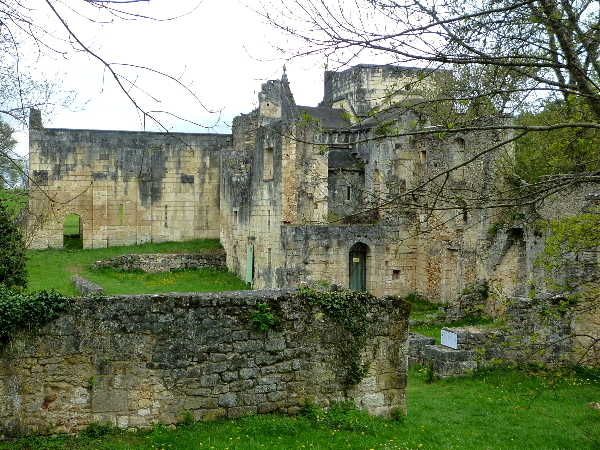 Since I've come to France I've been chasing down the Cistercian monasteries, irresistibly drawn to them, glorious ruins that appear like mirages or ghostly phantoms in the woods or at the edge of a farm. Which makes sense since the Cistercian monks followed the rule of St. Benedict and returned to manual labor, field work. They were the main force in technological diffusion in Metallurgy, hydraulic engineering and agriculture--move over Friar Tuck! And their architecture is one of the most beautiful styles of all the Medieval architecture. One twilit eve last week, driving to Villars in the Perigord Vert to see the prehistoric Grotte with its blue horses, sorcerer and bison painted in manganese by Cro Magnon man 17,000 years ago, I fell upon the 12th c.Abbaye de Boschaud, asleep in the hollow of a valley. The earth is full of thresholds, and I felt as though I had crossed an important one. In special places I like to see what the Tarot might have to say. As the light changed and the sky began to darken, I pulled the card "La Pances" from the Jean-Claude Flornoy deck. 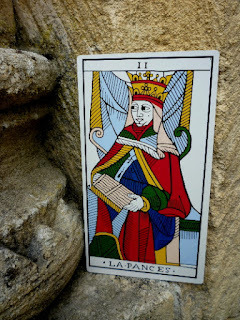 Jean-Claude, the master card maker who recreated two decks from the earliest Marseille decks, Jean Noblet c.1650 & the Jean Dodal c. 1701, died suddenly just before the St. Suzanne Tarot Conference last fall, so sadly I did not get a chance to meet him, but was happy to add his deck to my collection. mention "Pope Joan". One clever Hans said that it might be french homophony for "pensee", reflection or thought, though not widely used word in 18th c. France. More commonly the word is "belly, womb, stomach" or kangaroo pouch. "Spirituality isn't defined by the enclosure of the spirit in a dogma - whether religious or otherwise, but by opening the spirit to vast and new horizons that offer it evolution and elevation." This is such a shivering pleasure. I noted several subjects to look up so I could stay longer in this trance.